Here’s a charming children’s picture book I grabbed as soon as I noticed the author. Cate Kennedy is one of my favourite Australian writers for adults, and I was keen to see her first book for children. I wasn’t disappointed! 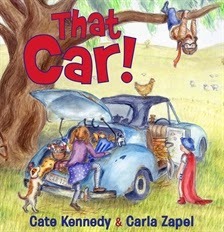 That Car was written by Cate Kennedy, illustrated by Carla Zapel, and published by Allen and Unwin, 2014. RRP: $Au24.99. From the publisher: We found the old car in the shed the very first day we moved to the farm. Dad put it under the peppercorn tree. 'You kids might as well play in it for the time being,' he said. We couldn't wait to find out where that car would take us. A story about three children, one old car, and a world of imagination. What I loved most about That Car is that it celebrates play and imagination. We had a rusting car next door when I was a kid, and it became our vehicle of choice, cubby house, picnic spot and fort. So the fact that the children journey off around the (imaginary) world in their car really resonated with me. Children will respond to the way Kennedy plunges them immediately into different scenarios. No need for tedious explanations when you play! Zapel was an inspired choice as an illustrator. There’s a lovely mellowness to her pictures. Her use of soft colour and detail adds a whole extra dimension to the story, while still leaving lots of room for our imaginations. Each illustration gives us lots to pore over, and frequently made me grin. Do look out for That Car if you want a story that helps kids make connections to their own play and imaginary fun. I know lots of schools look for resources about Australia - grab That Car!